Child-friendly?The Hobbit: An Unexpected Journeycertainly has its fair share of fantasy violence and white-knuckle moments, but the film is also filled with a sense of childlike wonder and grand adventure that makes it a great family event. Let me start by saying that I’m a huge fan of the fantasy genre, particularly J.R.R. Tolkien’s storied world of Middle-earth. When Peter Jackson first took on The Lord of the Rings trilogy a decade ago, I was ecstatic about seeing some of my favorite wizards, elves and dwarves come to life on the big screen. But where Jackson’s original foray into Middle-earth was succinct (at least as much as you can be with a trio of three-hour films), focused and gripping, thesame cannot exactly be said for the opening of his prequel trilogy, The Hobbit: An Unexpected Journey. The story opens years before the adventure of Frodo and the One Ring with Bilbo Baggins (played by Martin Freeman) – Frodo’s homebody of an uncle – living a quiet life in the Shire, home to the small race of hobbits. While Bilbo is content to spend his days drinking tea and walking about the forests, opportunity knocks at his door in the form of the scraggly wizard Gandalf the Grey (Ian McKellen) and a group of 13 lively dwarves, whose kingdom of Erebor was conquered by the vicious dragon Smaug. 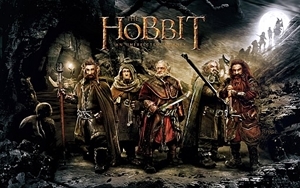 Bent on recovering Erebor’s lost fortunes from Smaug, who has taken up residence to the east in the Lonely Mountain, the dwarves and Gandalf manage to convince the reluctant Bilbo to join them on their quest. Marching through treacherous hills, goblin-infested tunnels and spooky forests, the tiny hobbit eventually becomes separated from the group, encountering the creature Gollum and his precious One Ring on the banks of an underground lake – setting the stage for adventures to come in the next two films. While I’m not saying that Jackson’s latest effort is bad by any means, as a Tolkien fan who has re-read The Hobbita couple of times, it’s easy to see where the film lags behind. For starters, stretching this single book – which is shorter than any of the three Lord of the Rings novels – into three movies was a mistake. That’s not to mention the abundance of material that was invented by Jackson and added to the story haphazardly. While kids are sure to get a kick out of The Hobbit: An Unexpected Journey’sepic thrills and chills, for true Tolkien admirers, it’s something of a letdown.Here’s hoping the next two films can make up for it. Child-friendly? With all the heroic action and fantastic villains Jackson has collected in The Hobbit: An Unexpected Journey,you’ll be hard-pressed to keep your children away from this classic tale of treasure-seeking adventurers. And if you’re willing to deal with the liberties the film takes with the original story, you’re bound to have a great time of it yourself. Recommended for children 8 and up.